As I was driving up to Clare Valley, I was pleased to observe that as I ascended I saw far more greenery, which lifted my spirits. My first stop was the Clare Valley Wine, Food and Tourism Center. I figured that I should try something different and possibly go on a winery tour, learn about the different wines and how they’re made, and hopefully find one that I enjoy. Upon entering the center, I was greeted by a lovely lady who kindly told me that I was about 3 hours late for a tour. They usually take place in the morning at 9 am, and it was hitting noon. More disappointment or, in this case, poor planning on my part - lesson learned. However, not all hope was lost: she took out a map and told me that I could take myself on my own self tour. She kindly highlighted various wineries or areas that she thought I might find of interest. Then she sat me down and let me taste three wines that were native to the area. If I recall correctly, she explained that the taste of the wines varied based on the soil and the climate of the area. The region we were in produced drier tasting wines. I already knew from my wine tasting experiences in France that I was NOT a fan of dry wines. However, I decided to try my luck, as perhaps my palate had changed. She let me taste three Hunky Dory wines, and I tried really hard to like them, but they were not for me. First stop was the Spring Gully Lookout. Less than a 10 minute drive away, I was able to get a pretty nice view of some of the surrounding land and wineries in the area. I do appreciate the variation in the land, vegetation and views that Australia has to offer. Being on this hill by myself was so serene, I felt like I had all this land to myself. Next up was the Sevenhill Cellars. This was a large parcel of land with a beautiful church on the property, as well as a walking trail along the winery. I didn’t try any wines for the rest of my time in wine valley. Based on the conversation with the lady at the information center, I wasn’t under the impression I would find a sweet wine. Also, I was driving to each location and figured it would be wise not to be under the influence behind the wheel. I drove a little more east, still in wine valley, towards Mintaro, because I wanted to check out the maze. I had to pay a fee to enter the maze, but I was impressed because it was a decent size (taller than me, and pretty large) and harder than I thought to navigate. For those of you who follow me on my Instagram and watched my story, you probably saw my struggle. Every time I walked into a dead end I was greeted by a small statue of some sort. Let’s just say that I ran into a lot of them. However, I eventually completed the maze and made it to the middle. Once outside the maze there was also a lovely garden covered in gnomes and a huge chess set for those who wanted to play the game. Fun activity sheet that they give you to complete as you go through the maze. 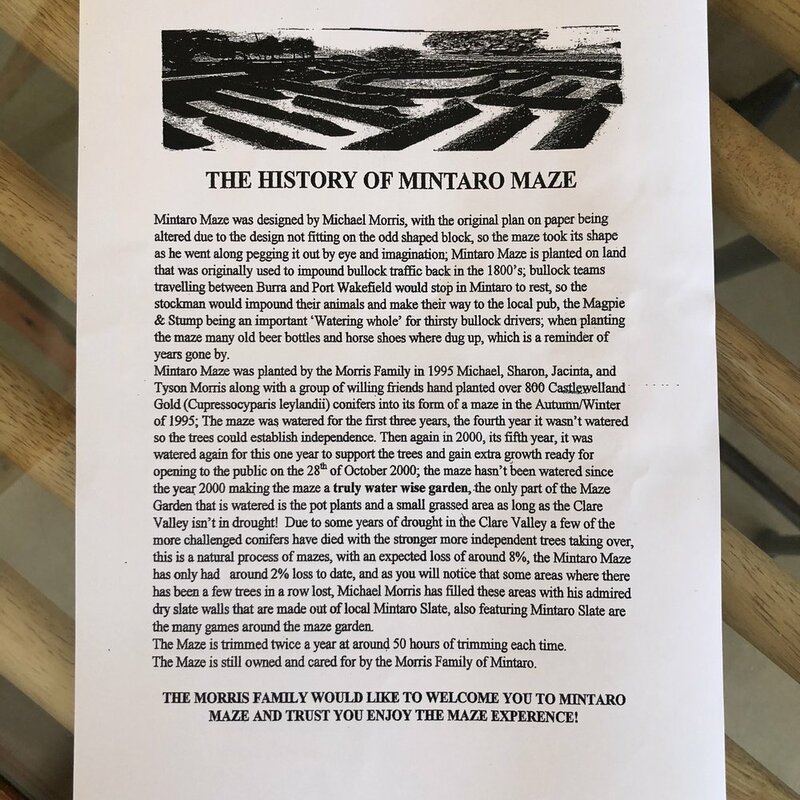 The activity sheet also included the history behind the Mintaro maze and how it came to be. I enjoyed my time in wine valley - the weather was perfect, the sun was shining and it was nice to see a different side of South Australia. The only downside was the flies: they were ruthless and would not leave me alone. I still had a lot of daylight left so I decided that instead of driving back home to Adelaide, I would check out Port Noarlunga! My teammate had taken pictures there and it looked beautiful, so I just had to check it out for myself! You can read all about it in part three! Are you a wine person? If so, what sweet wines would you recommend to someone like me?